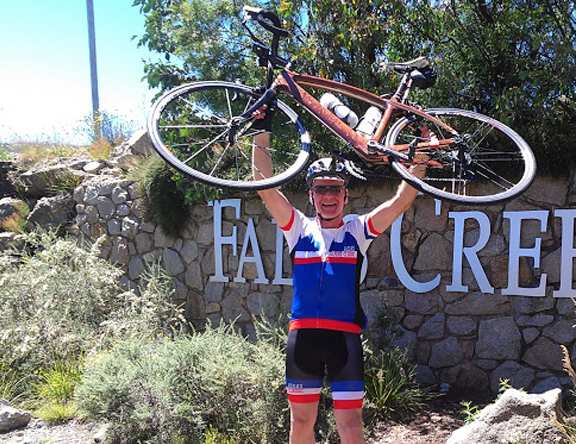 Cycling 200ks in the Victorian Alps, at pace, in one day sound like fun to you? To Andrew it is, his annual pilgrimage to do the Alpine Classic has been on his calendar for close on 10 years. “I love the mountains, the freedom of cycling in absolutely amazing environments. I don’t love the challenge of getting up in those dark, cold Melbourne winter mornings for training and keeping up my fitness to do these types of events”. The greatest pleasure from this year’s event: “To ride my new bike, a one of a kind pure hardwood mean machine – absolute pleasure, no discomfort after a full-on day in the high country – undoubtedly the best bike I have ever ridden”. The greatest disappointment from this year’s event: “bitter sweet actually – I smile each time I think of it. A mate who had never ridden this event was encouraged to participate – and he was the winner of an all expenses paid tour to “La Tour de France”. Viva la cycling! Any questions regarding cycling, cycling injuries or bike fits, Andrew is your man. Call Glenhuntly Road Health Clinic to book an appointment with Andrew on 9532 8001.